Kind of an odd way to begin an article, but it pretty much sums up what we’re going to talk about in this report from the annual Belgian Pinball Championship. Here we are again at Pinball News to tell our story of this year’s Championship, but since we both had to, and wanted to, change a lot of things, let’s not only talk about the changed Championship, but let us also shake things up in the article itself! 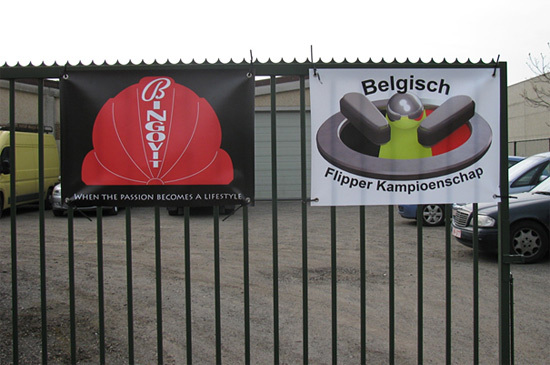 As many of you probably know, I’m the organiser of the Belgian Pinball Championship (a.k.a. Battle for the Kingdom) so I will give my opinion first along with some pictures, BUT that’s not all. We asked the players to write some reviews about the Championship which will give some different takes on the same event. 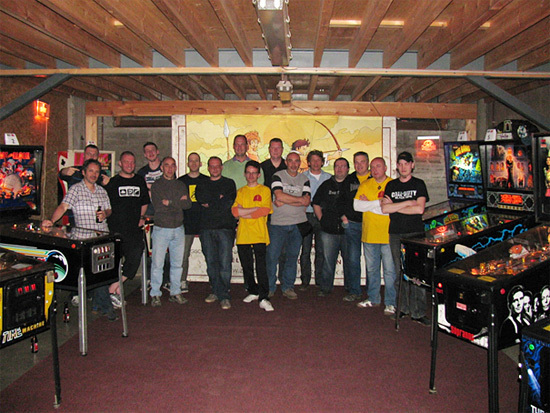 Let’s “go back in time” and start with where we left last year, that was, of course, the Belgian Pinball Championship 2010. Although it was a rather good year, this is where our road to a changed Championship landscape started. After making some conclusions about what went wrong and what we needed to improve from 2010, we can fast forward to September the same year. 'Why September?' you may ask. Well, that’s because in September it is decided when the Collector Fantasies fair (at which the Championship takes place each year) will he held. However, this year there was a lot of doubt when - and how - the fair would take place. To cut a long and quite frustrating story short, it was decided that the fair wouldn’t take place in 2011. Sadly enough, the final decision was only made around December, and surely we couldn’t arrange a location, date, etc. for the Championship in such a short amount of time. As if the changes which just happened weren't enough, we also had a major shift in the organisational team. Kris & Isabel with who we had teamed-up since 2008, made the decision to quit the organisation for personal reasons. It was a sad decision which also had major consequences for the overall organisation work. Since we wanted to pick a date quickly, it was decided to have the Championship take place at Bingovit’s, which also hosts the yearly OpenGameRoomWeekend, as you may know. So here we are. The team has changed, the location has changed and - once again - that’s not all! The Championship’s main goal is to entertain people and just have a good time filled with pinball, which didn’t happen so much at the Collector Fantasies show. So our main goal was to expand both the amusement factor and the competition factor. Since I have a pretty extensive collection, I could set them all ready for amusement. And because we wanted to have a LOT of pinballs for amusement, we also had some of our own pins for sale, along with some others from a friend of mine. 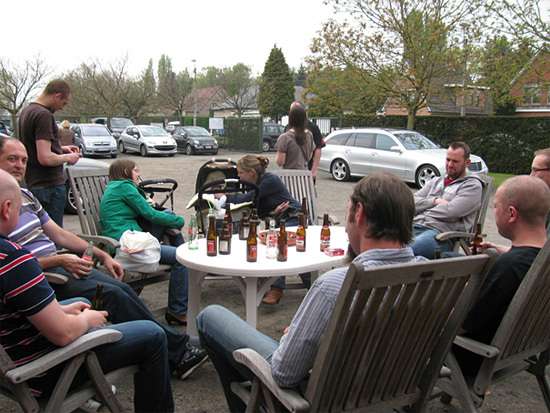 We also invited visitors to bring along a pinball in exchange for some free drinks. The other side of our line-up this year consisted of The Rolling Stones, The Sopranos, The Addams Family and BIG BANG BAR! Carl Jacobs from Private Gameroom also brought some pinballs along for sale, and of course he had a stand filled with pinball parts from rubbers to bulbs to specific Stern parts. Can you spot the stunning statues he brought and name them? and these were guarded by well-known movie figures! All this talk brings us to the main portion of the article, the competition part, if you will. So basically we stirred things up here too. Since we were changing everything else it was natural to make some changes here too. What we did was to add some more competition into the Championship. The main Championship was almost exactly the same, except for some minor changes to the rules. We also added the Junior Championship for participants under sixteen years old. This was a mixed competition in which we welcomed fifteen young enthusiasts. A few years ago I had the idea for a "Winner Takes It All Challenge". It was a simple pay-to-play area, which means that you can play as many games as you want BUT you have to pay for each game. The competition consisted of two challenges which were a set the high score, and a blackjack. At the first game you had to set the highest score on an electro-mechanical machine, while with the blackjack you had to play as close to a pre-determined score as you can get. The closest player from the blackjack and the high score winner played a final round for the highest score to decide the winner. 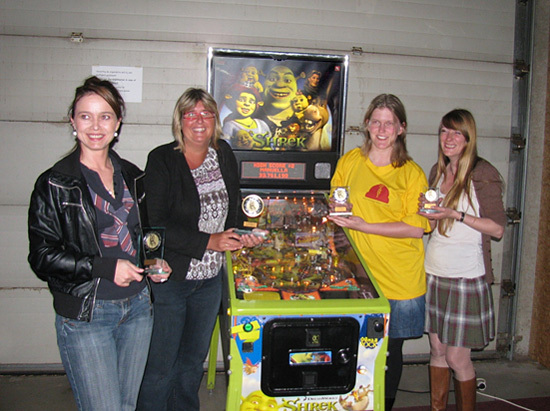 The player who won became the "Winner Who Took It All" and took, along with the trophy, the pinball machine on which the final match was played. This was my short introduction for the Belgian Pinball Championship. Beneath you'll find two articles from a participant and a referee. After those I'll conclude the article with some pictures and comments concerning who won and descriptions of what went down. Saturday, April 16th, wake up at 06:30. My wife and I volunteered as referees for this annual pinball event, so we had to be there early for final instructions and other practical things. The BPC is normally held together with the Collectors Fantasies show at the Neckerhal in Mechelen, but this year it was held at Bingovit's place in St-Niklaas. His dad’s wood shop machinery hall was transformed into a giant game room: a large free play area and a smaller competition area. 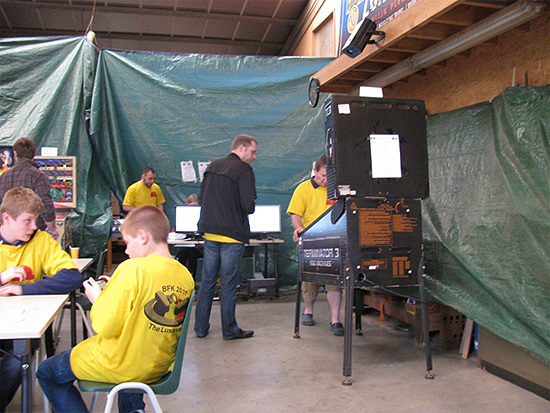 This competition area held seven machines for the sixteen years old or older players, and two machines for the juniors. 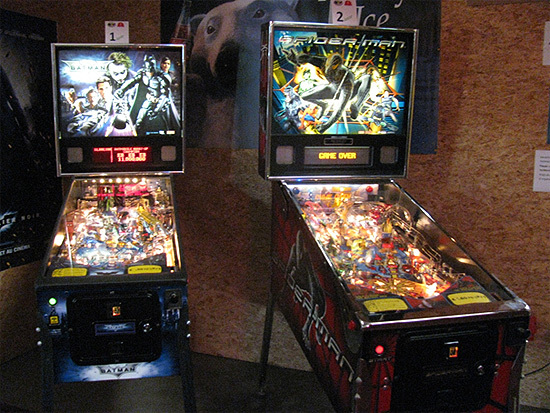 These machines, set on three balls, were: Big Deal (1977), Beat the Clock (1985), Time Machine (1988), Big Bang Bar (N°69, 2007), The Adams Family (1992), The Sopranos (2005), The Rolling Stones (2011) and, for the juniors, Batman - The Dark Knight (2008) and Black Spider-Man (2007), all in super condition! The machine for the finals was kept secret until then. Beverages and food (hamburgers, hot dogs and ice cream) were available the whole day for democratic prices. About one hundred players were registered for this event and each player received a goodie bag and a scorecard after paying the entry fee. All players were allotted a one-hour time window to play their seven qualification games. This prevented the qualification area becoming overcrowded - a very nice solution to avoid peak moments and queues. 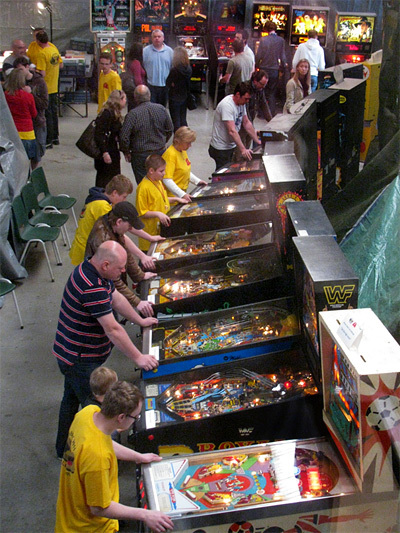 The sufficient number of referees allowed them to take an occasional break in the free play area with forty pinball machines set on free play, or to try for one of the side games; “Set the High Score” on a Gottlieb’s Super Soccer (1975) and “Blackjack” - set your score as close as possible to a pre-defined target score on a Terminator 3. “Set the High Score” was won by Koen Willockx - our pinball tournament software wizard - while “Blackjack” was won by Heikki Pauwels. Both played the final on Super Soccer which was won by Heikki Pauwels. 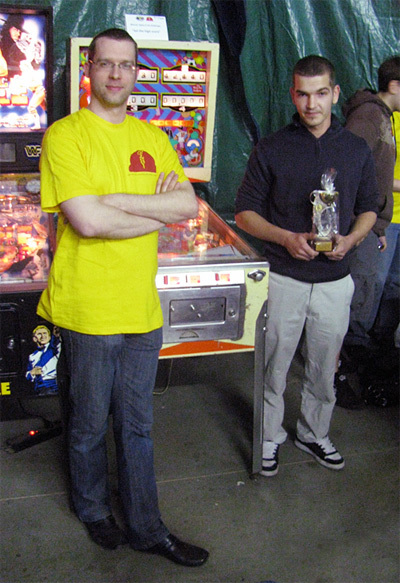 Beside his trophy and the title “Winner Who Took It All 2011”, he got the Super Soccer pinball machine. The four best qualified junior players and the four best qualified women went directly to their respective finals. 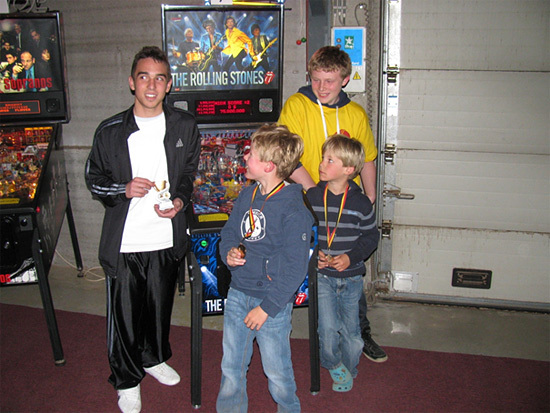 The junior final was won by Anthony Rorive in which he played an amazing game on The Rolling Stones, scoring 263,343,920. The women's final was played on Shrek and was won for the third time in a row by Sandra De Ridder. The top sixteen men qualified for the quarter finals, resulting in eight players for the semi- finals. This ended with the best four players having their final game on Shrek. 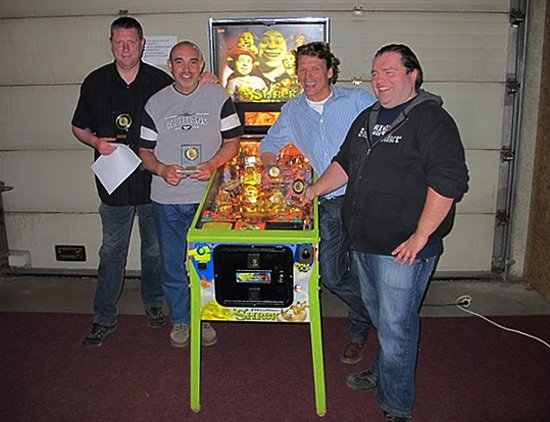 The final four were: 4th - Eric Buysen, 3rd - Peter Smets, 2nd - Michel Rorive, and the Belgian Pinball Champion 2011, Olivier Renders. Congratulations to all who qualified and all the winners. Many thanks to Evert “Bingovit” Brochez and his team who organise this tournament which became, for many players, a fantastic pinball day. I’m fairly new to the pinball scene, as a collector of pinball machines anyway. As a player I have been doing this since I was thirteen years old, but I only bought my first machine a few months ago. But the “bug” has bitten me really hard because a few months later I’m the proud owner of six pinball machines! But like many people, I wanted to share my passion with other people and through my search I came to a little website called 'gameroom.be' . Since my registration I have come to know a lot of really great and nice fellow pinball lovers, and some of them had told me that I should enter the yearly BFK. I wasn’t really sure at first if I should do this - I’m not what you would call a good pinball player - but after some encouragement I decided to join up. After all, the old cliché comes to mind; taking part is more important than winning! Since I’m new, I can’t really speak about or make comparisons with previous BPCs, so I’m only going to talk about my experience at this year’s event. This year the BPC was held at Ramovit, the workplace of Ronny Brochez, father of Evert the owners of Bingovit. They, and the volunteers, made it an event to remember! When I first arrived at the venue I noticed that outside was a hamburger and ice cream stand, so I knew people wouldn’t be hungry on this BFK. After my registration, I received a lot of coupons for a free snack , Zonderik beer and one other item. There was also a coupon for a free goodie bag, and it was really full with terrific stuff! Since it was time to start my qualifying round I decided to get going right away! When I entered the game area I noticed everything was set up very nice and orderly. There were seven pinballs available for the qualifying round and there were some real beauties amongst them. There was a nice collection of old and new pinballs to play. I think it will be hard to top this great combo. My qualifying went smoothly, much better than my actual playing (let’s never speak of this again). The volunteers did an excellent job here. Afterwards it was time to start my exploration of the BPC itself. The first thing to note is the large number of recreational pinballs available. I have never seen so many flippers under one roof! I have only one word for this; 'impressive!' 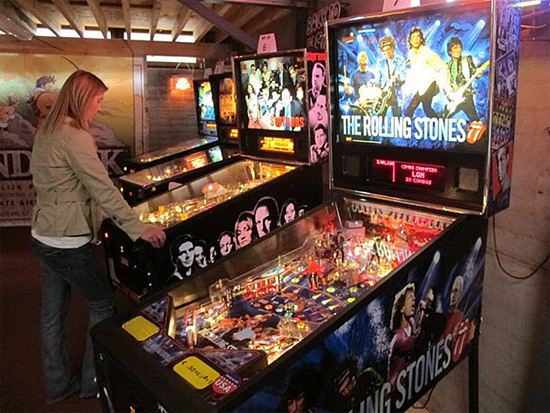 There were a lot of different kinds of pinballs available, from the modern classics (Monster Bash) through some underrated ones (Flintstones), and of course the new ones (The Rolling Stones) . There was enough variation to satisfy everyone. 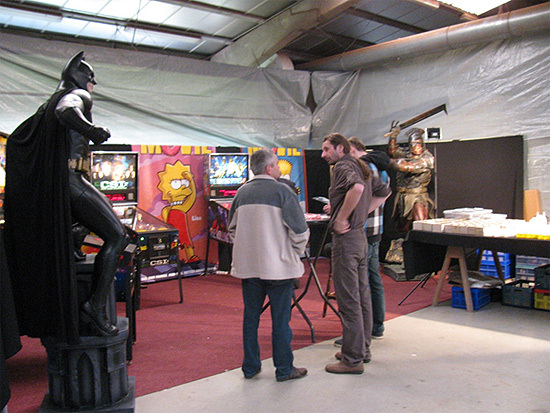 Carl Jacobs was also there with his well-decorated stand (Uruk hai!) to provide customers with any parts they needed. I even noticed a few arcade games in the corner as well. Personally, I had a blast that day. I met some really cool and friendly people, and the choice of pinballs was more than excellent! As the BPC came to a close, you had to be deaf and blind not to notice that most (if not all) people thought this BFK was one of the best ever. So, major credit and respect to Ronny and Evert, and of course all the volunteers who made this day one to remember! I think the reviews from Yves and Vincent pretty much sum up what happened this year, so I'm going to conclude this article with some pictures taken at the event. Let's enjoy some pinball spotting shall we? who battled for the title of "Winner Who Took It All"
Below you'll find three links, one with the full results and the other two feature two albums with these pictures and even more!) In my album I've added a lot of commentary to give some extra hindsight along with the pictures. 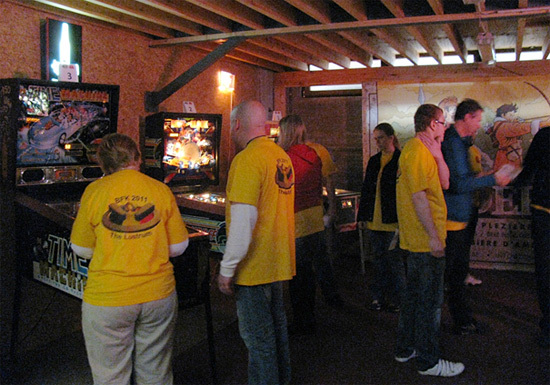 Additional pictures from the Belgian Pinball Championship 2011 can be found here and here.